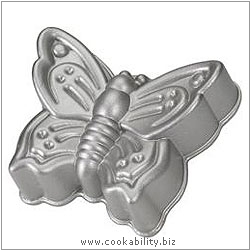 Bakeware made from heavy cast aluminium to provide superior baking performance. Baked goods rise evenly, cook uniformly, are finely detailed and have delicious golden crusts because of the excellent conduction of these walled pans. Special heat reflective exterior and premium non-stick surface assures perfect results. Non-stick care advice.